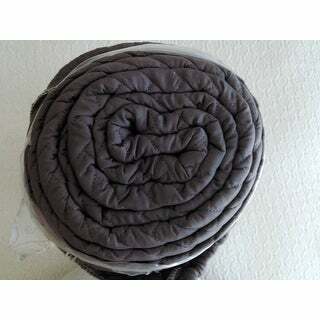 Unfortunately, I'm returning the coverlet because it's a much darker gray than the light gray pictured in the Overstock photo. I've included a photo of the coverlet I received. I haven't taken it out of its packaging because it's going back. Hopefully, this is enough to share the actual color. Returns can be such a hassle, but I have to say, the Overstock customer service for this return was excellent! I'm only giving the coverlet four stars due to the inaccurate color, but since I haven't opened it fully, I can't really speak to its quality. I needed a navy throw to complement a patterned king size duvet. 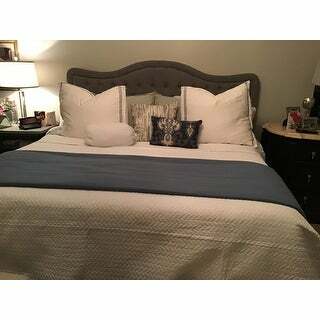 I ordered this coverlet in queen size and it works perfectly at the bottom of the bed. The shams were definitely a bonus and look great with my coordinating king size shams. 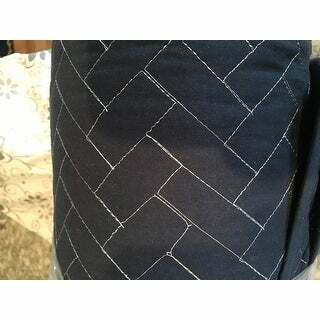 The material is very soft and the herringbone pattern adds texture. I’m very pleased with the purchase. 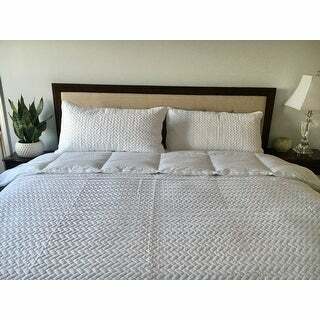 This is a true white coverlet. I love the weight of it. It is perfect for Texas nights not too heavy but a nice cover. The king size comes with king size pillow shams. This quilt is beautifully made and a nice weight. I bought a king size to drape over my queen size bed. It looked exactly the way I wanted it too. Long on the sides and the foot of the bed. The yellow was a soft butter color that was great but sadly was not the yellow I needed. It will be returned but be careful, Overstock does not have free returns! I really like my new quilt. The color and pattern are exceptional. I purchased a high quality quilt for a low price which equals a great value. It was shipped fast as which is expected by overstock and was packaged properly. After I washed this quilt, it is very soft,warm and very comfortable. I sleep great. I plan on purchasing another for my son. I highly recommend this product to anyone who is needing a high quality low priced quilt. I bought the navy and it has terrible white stitching that is so uneven. What I received is not what it looks like in the picture. 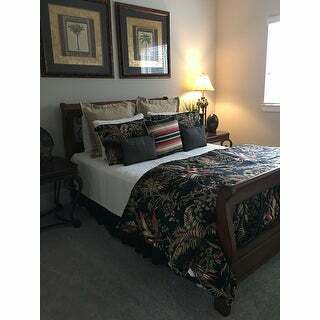 The grey comforter is much darker than shown, more charcoal than light grey as the listing photo suggests. Since there is a disclaimer about the color shown vs the actual color, I guess we're stuck with it. In the photos I'm submitting, the wall colors are light grey. The quality is fair, not great. I just threw it on the bed to see what it will look like. Does not add anything "elegant" to the decor. 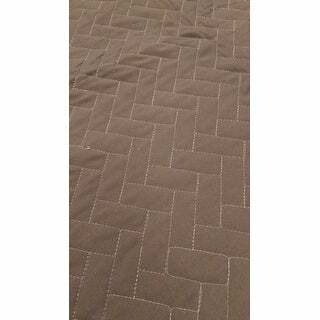 This coverlet reminds me of the mover's pads that were used to wrap our furniture during our recent move. Overall I'm disappointed in the color and the quality. 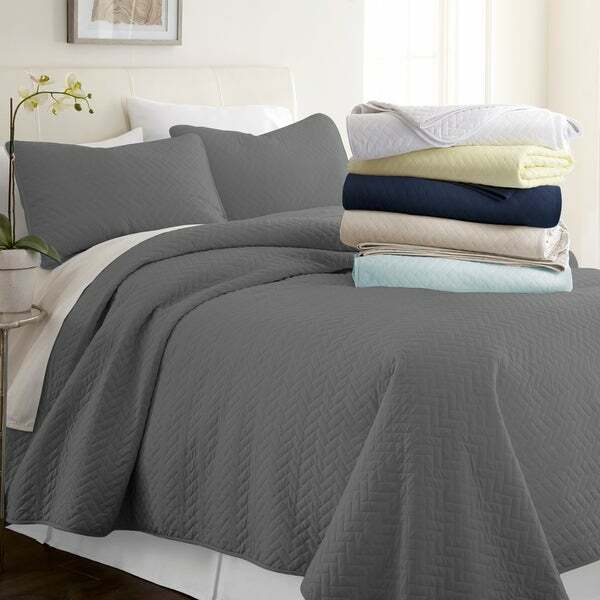 This coverlet set is so beautiful! I purchased it in order to lighten up our guest room, and I think it turned out beautiful. It’s extremely soft and great for layering, as shown. Great blanket! Love it. It’s soft and easy for making the bed. I have a down comforter underneath and the coverlet over it. This is it on my new Overstock bed with an Overstock 9inch smart boxspring and 11 inch Overstock mattress. Super soft and thin so that if you use it with a thicker blanket underneath its perfect. The gray you see is a dark graphite gray in reality. I will still use it. I think for the money its worth it. I just hate that on overstock its always a gamble as to what color you see to compared to what you will get. It’s so pretty and simple. Perfect for the summer. I was skeptical buying without being able to feel the fabric, but based on other reviews I decided to take a chance. The fabric is gorgeous! Soft and luxurious. These quilts exceeded my expectations! I was worried that the Ivory color might be too beige but it is a true ivory. Would definitely order again. Just like it stated and it’s great! The color is exactly as expected and matches other items I ordered described as ivory. The material is very, very soft. They look great paired with the white sheets that I purchased. Beautifully constructed.Vibrant yet subtle colors.great buy. This quilt was perfect for year round use. Light weight but warm with quality material. Pleasantly surprised by the warmth supplied, even though it is light weight. Highly recommended. I ordered two of these in twin size navy for bunk beds. I received two quilts but they were different. One had a light colored stitching and the other was solid. Will send these back and will not reorder from here since I will be charged shipping for there mistake. Very disappointed. "Is the yellow a true yellow or soft/butter yellow?" Butter yellow....and I love it. Found that the true yellow was too garish....in another quilt which I bleached to get it butter yellow. 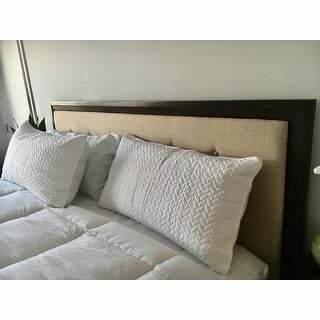 Love the herringbone pattern and wanting a light weight spread for my bed. White goes with everything. I am going to make a slip cover for my couch with it to keep my dogs from destroying my new couch. "Is the Navy a true (dark) Navy? One photo with the quilts stacked, the navy appears darker, but the photo with the bed made in the navy makes the blue appear more royal blue." It is a dark navy...but holds up well against other navy ...love it.